Sharma carded a 3-under-par last-round 69 to finish three strokes clear of South African Eric van Rooyen in an event that stretched to five days because of bad weather. India's Shubhankar Sharma completed his maiden European Tour triumph on Monday in Johannesburg by winning the Joburg Open tournament he almost did not compete in. He carded a 3-under-par last-round 69 to finish three strokes clear of South African Eric van Rooyen in an event that stretched to five days because of bad weather. The final round was suspended on Sunday due to torrential rain, lightning and hail and resumed on Monday at 7:30am local time. The 21-year-old Sharma birdied three holes on the outward trek at the Randpark Golf Club, then parred all the inward-nine holes with immaculate approach shots and putting highlights of his game. His late decision to visit South Africa for the first time paid rich dividends as he pocketed a 2.6-million rand (US$190,000) first prize. "I am thrilled that I came to the Joburg Open," said Sharma after adding to five victories on the Indian circuit. "It has been a very long Asian Tour season for me so I was considering whether I wanted to visit South Africa. I am really happy that I did." 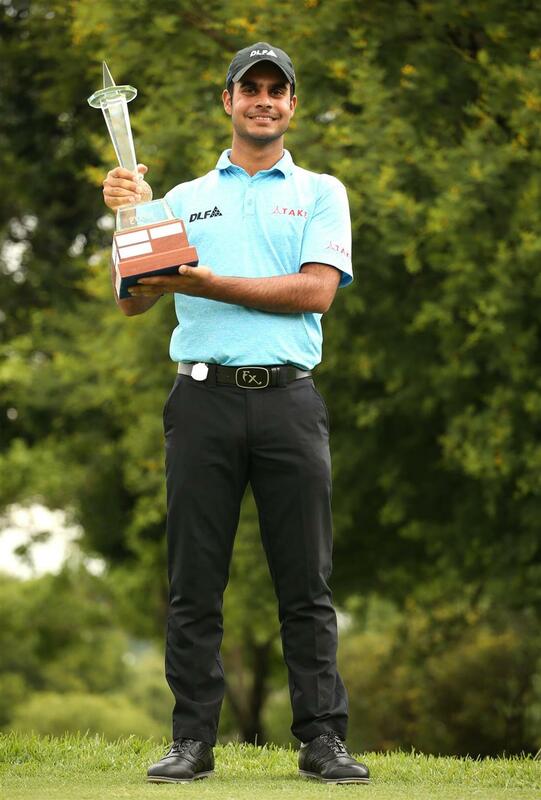 "Winning the Joburg Open on my first trip to South Africa is a wonderful feeling," Sharma said soon after receiving the trophy from Johannesburg mayor and keen golfer Herman Mashaba. "I met my caddie for the first time last Monday and we worked so well together. Heeding his advice was a key factor in my success. "Saving par on a number of holes thanks to up and downs played a significant role in keeping me at the top of the leaderboard." Van Rooyen quickly became the biggest final-round threat to Sharma and five outward-nine birdies narrowed the gap to four shots by the turn. But he could add only one further birdie, leaving steady Sharma to succeed one week after compatriot Arjun Atwal finished runner-up in the Mauritius Open. India's Shubhankar Sharma poses with the trophy after winning the rain-hit Joburg Open at the Randpark Golf Club in Johannesburg, South Africa, on December 11, 2017. The 21-year-old won by three strokes. In Naples, Florida, Steve Stricker and Sean O'Hair captured the QBE Shootout on Sunday, finishing off a wire-to-wire victory with a best-ball 8-under 64 in the final round. The duo finished two strokes ahead of Graeme McDowell and Shane Lowry to win the 24-player unofficial PGA Tour team event. Pat Perez and Brian Harman placed third, four strokes adrift of O'Hair and Stricker. Lexi Thompson, the lone woman in the event, tied for fourth with her playing partner Tony Finau. O'Hair and Stricker finished the tournament at the Tiburon Golf Club at 26-under 190. The Americans set the tone in the tournament with a superb 15-under 57 during the opening round scramble. "We just really jelled well together," Stricker said. "With his length the first day, getting some clubs into the greens, some short irons for me, we just fed off that first day quite a bit. We felt comfortable with one another." This is the second time both players have won this event — Stricker having won in 2009 with partner Jerry Kelly and O'Hair five years ago with Kenny Perry. O'Hair and Stricker are the second team paired together for the first time to win the tournament. The first was Brad Faxon and Scott McCarron in 2000. "This is always a great event to finish the year off with and to pull this off is special," O'Hair said. The 50-year-old Stricker has won a dozen times on the USPGA Tour with his most recent victory coming at the 2012 Tournament of Champions. He captained the United States to victory at the Presidents Cup two months ago. O'Hair has won four times on the Tour with his most recent victory coming six years ago at the Canadian Open.